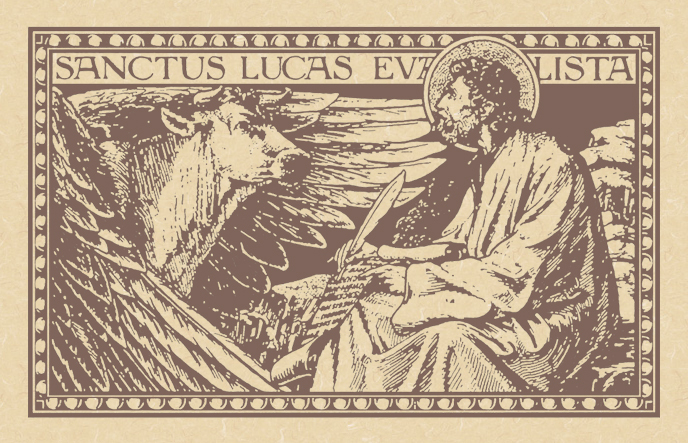 The Feast of Saint Luke, Evangelist. • II Timothy 4: 10-17. • Psalm 145: 10-13, 17-18. 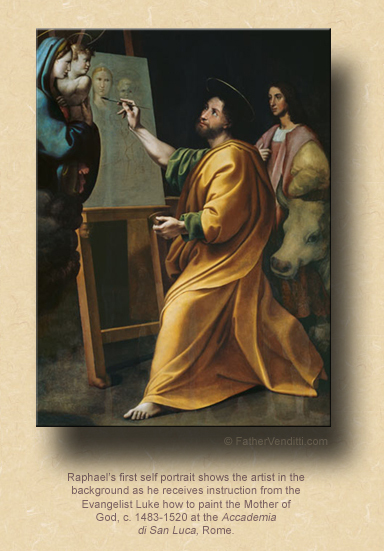 The Second Class Feast of Saint Luke, Evangelist. • II Corinthians 8: 16-24. • Colossians 4: 4-9, 14, 18. • I Thessalonians 1: 6-10. 9:43 AM 10/18/2016 — As this Feast of Saint Luke approached I wanted to look back and see what I had said previously, and was surprised to learn that I had never preached before on his feast. I’m not sure why or how that came about. He is, of course, the human author of two of the most important books in the Bible: the Gospel that bears his name and its sequel, the Acts of the Apostles. That Saint Luke wrote the Acts of the Apostles has never been in dispute: his authorship is mentioned in the Muratorian Fragment and in the writings of Saint Irenaeus, both coming from the second century, and in the third century it's mentioned by Saint Clement of Alexandria, Origen and our old friend, Tertullian. Both books, Luke's Gospel and Acts, begin with a dedication to a man named Theophilus, a name which means “lover of God,” and on that basis some have suggested that Theophilus was not a real person but rather anyone who would be reading these books to learn more about our Blessed Lord and His Church. The date of the composition of both books is uncertain: Saint Jerome puts it around the time of Saint Paul's first imprisonment in Rome, which would be between AD 61 and 63; but, most scholars today seem to favor the idea that they were written after Peter's death, around 64, and accept the notion that Luke's Gospel and Acts were originally written as one book, later separated in order to put the four accounts of our Lord's life together as the New Testament slowly began to take on its present form, which really didn't happen until Saint Jerome's time in the fourth century. But clearly the main source of Luke's information in Acts comes from the Blessed Apostle Paul himself, which explains why Paul's story is so prominent throughout the book, and how Luke is able to relate, word for word, conversations that Apostle had with various individuals, and the detail with which Paul's various journeys on behalf of the Faith are recorded. Those of you who were with us on Sunday may remember me mentioning, in the context of our Lord’s parable about the unjust judge and the poor widow, how Saint Luke introduces the parable with an editorial comment, then asking why, given that the parable doesn’t exactly require a secret decoder ring. Well, today you will need your secret decoder ring; for, in order to attempt to appreciate this man Luke and the great gift he’s given to the Church, we need to look at the very beginning of his Gospel, with our secret decoder rings set to the number seventy. Luke begins his Gospel with the conception of the Forerunner, John the Baptist. The story of Zechariah learning of the impending pregnancy of his heretofore barren wife is one of those familiar pre-Christmas yarns that we think we all know: the arrival of the Baptist is announced to him by an angel and, because he expresses incredulity at the idea, he's punished with the loss of his voice; but, these are so much more than just straight-forward facts. There is a mystical component to Luke's Gospel that is overlooked, I think, by even the most erudite Scripture scholars, reflecting Luke's own background. 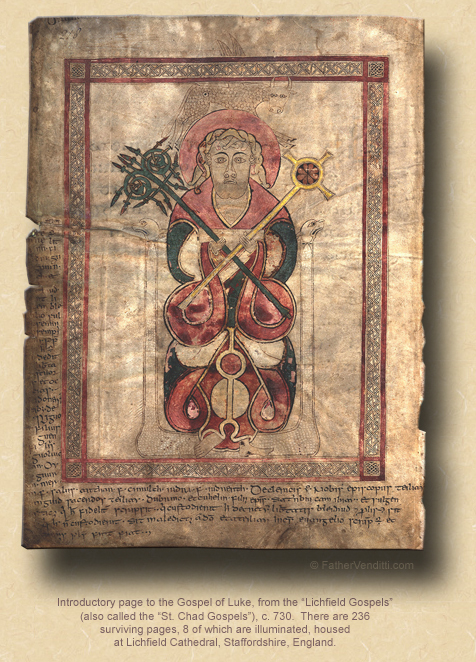 We tend to look toward John's narrative as the mystical Gospel—I think I said that myself just last week—because it deals not such much with fact as with theology and spirituality, and it shines forth even in the most pedestrian of translations. But Luke's Gospel is so sublime in it's mystical elements, most of the people who have translated it probably didn't even understand themselves what they were reading. For sure, it's probably the most beautifully written piece of prose in the Bible, laid out in the most perfectly metered Greek ever put to paper, all of which is completely lost when translated. You've heard the cliché, “Poetry is what is lost in translation.” Well, it was never more true than in the Gospel of Saint Luke; after all, he was a Greek, born to Greek parents in Antioch in Syria, baptized a Christian while still a very young man, probably around AD 40. By the year 44 he had become acquainted with the Apostle Paul and, because he himself was not a Jew, he appreciated Paul's efforts to champion the rights of Gentile Christians to the Church in Jerusalem. His pagan origin and frequent travels outside the Jewish world of Palestine brushed away the racial prejudices that sometimes show through in the Hebrew writings of Matthew. Of all the evangelists, he was the most educated, not only trained thoroughly in the Greek classics, but also in medicine, and it comes out in his narrative in unique ways: he's keen and observant, always attuned to any kind of human suffering, always ready to forgive but very intolerant of quacks and hypocrites; and, of all the Gospels, his frequently gives us the psychological context of the events he's describing to us, often telling us how people reacted to things Jesus said and did rather than just relating the events, even sometimes speculating about their inward dispositions. How many times have we read Luke telling us something like, “Whereupon the Pharisees and scribes fell to reasoning thus, 'Who can this be, that he talks so blasphemously? '” (Luke 5: 21 Knox)? Now, how could Luke possibly know what reasoning was going on in the mind of a Pharisee? Because he's a psychiatrist. He knows what makes people tick. But Luke is also a convert, which means he knows the faith better than anyone; and, even though he was not raised with the Hebrew Scriptures, he's taken the trouble to learn them from Saint Paul inside and out, and this is exactly what we miss when we read him in a translation; because, the very beginning of his Gospel, in which Zechariah receives the news of his son's birth from an angel, is right out of the Septuagint, a Greek translation of the Hebrew Bible by a legendary group of seventy rabbis begun in the third century BC, the word “Septuagint” from the Latin septuaginta, meaning “seventy.” What Luke has done is to masterfully breath across the first chapter of his Gospel the style, the vocabulary, even the meter of the Septuagint's Greek version of the Old Testament, where we read about women like Sara, Rebecca, Rachel, Anna, all of whom were sterile, and all of whom gave birth, through divine intervention, to one or another of Israel's great leaders. One of those accounts we read some months ago, from the Book of Judges, in which the wife of Zorah, who is barren, receives a message from an angel that she is to bear a son who will deliver Israel from the Philistines, and thus is born Sampson. 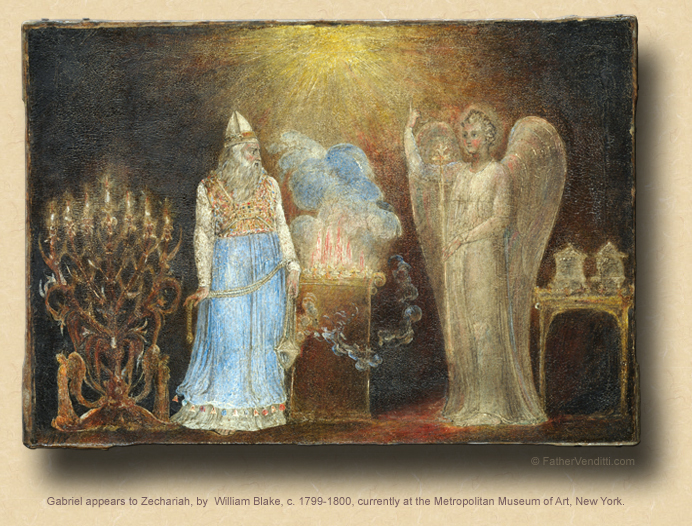 That angel is not named, but the angel who appears to Zechariah while he's in the Temple burning incense identifies himself as Gabriel, whose next stop will be to visit our Blessed Mother, but who last appeared in the Bible in the Book of Daniel, where he told Daniel, in answer to his prayers, that, after a period of what he called “seventy weeks of years,” God's people would return to the Holy City of Jerusalem and rebuild the Temple (cf. Daniel 9); and, if you count them, from the moment that Gabriel appears to Zechariah in that same Temple, to the moment our Blessed Lord is brought there to be presented to God in obedience to the Law of Moses, there passes—by Luke’s reckoning—exactly 490 days, or seventy weeks. Way back in Advent, almost a whole year ago, I had reminded you of the seamless transition from the Old Testament to the New in response to our Lord referring to John the Baptist as Elijah in Matthew 11 (vs. 2-10). *** Saint Luke illustrates it in many different ways, not least of which being his more than clever use of the number seventy. It may be the most brilliant literary device ever conceived, made more so by the fact that it was all inspired by God to tell us the story of our Savior. When Gabriel appears to Zechariah in the beginning of Luke’s Gospel, the first words out of his mouth are, “Do not be afraid,” but even this is more than what it seems. The Greek is μὴ φοβοῦ; it appears in the Septuagint version of the Old Testament at least five times—in Genesis, in Joshua, in Daniel—any time someone receives a vision or a message from God, and Luke has lifted it exactly. Like the prophet Jeremiah before him, the child Gabriel announces is anointed by God before his birth for the work of redemption. When Gabriel tells Zechariah that his son “is to drink neither wine nor strong drink” (1: 15 Knox), Luke is lifting word for word the Nazarite vow from the Book of Numbers (6: 1-8). When the Angel says that John will “bring back many of the sons of Israel to the Lord their God” (v. 16 Knox), Luke uses the word ἐπιστρέψει, to “turn back,” the same word used when Elijah “turned back” to Mount Sinai to rediscover the God who had once revealed Himself there to Moses (Isaiah 19: 3-13); and, the prophet Malachi uses the same word to declare that Elijah would return before the day of the Lord, to "turn Israel back" to the law of Moses, and reconcile father to son and son to father (cf. Mal. 3: 22), and this is how Luke makes the connection between Elijah and John the Baptist in anticipation of recording the words of our Lord, with the clear intention that when we read our Lord saying it, our thoughts will go back to the beginning of his Gospel and to all the Old Testament references alluded to. 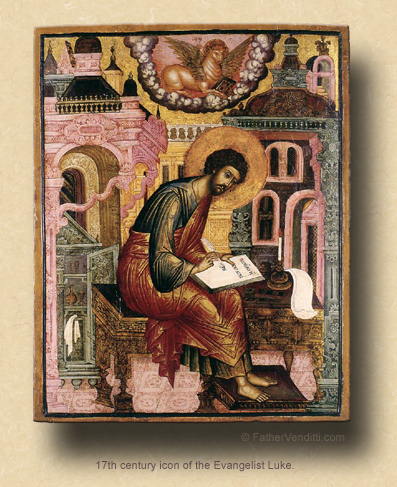 All of this is just a sketchy flavor of what kind of insight and brilliance Saint Luke poured into not only the story of our Lord’s entrance into this world, but throughout the whole of his literary output in relating the life of our Lord and the history of the early Church. Why go to such trouble? Why should Luke take the time to craft the story of our Blessed Lord with such brilliance and subtlety, using cryptic literary devices and hidden references to ancient rabbinical texts that only one in a thousand people would be able to recognize? Why doesn’t he just list the events and be done with it, the way Matthew and Mark do? Because only a mind as absorbent and elastic as his could understand and desire to communicate to us something profound: Luke’s care in crafting the story of our Lord and His Church is really all just a reflection of the care taken by God Himself in crafting the means of our redemption, which is exactly what comes out in Luke’s beautiful words. When the blessed Evangelist wrote of these things, he poured so much of his brilliant mind and heart into his words because he understood that he was writing of the greatest event in human history. As we approach our own celebration of these mysteries each day in the Sacrifice of the Altar, let us resolve to apply that same level of care and detail to preparing our souls for it. * In the Typicon of the Ruthenian Church, in most cases, the Feast of an Apostle or Evangelist is neither a Solemn nor Simple Holy Day, but only a Feast concomitant with a memorial in the ordinary form or a third class feast in the extraordinary from. Note that the Typicon entitles Luke an "Apostle and Evangelist," even though he is not an apostle; though, it should be remembered that many saints who are not among the Twelve are often accorded that title in the Eastern Churches, as the typicon uses the term braodly. 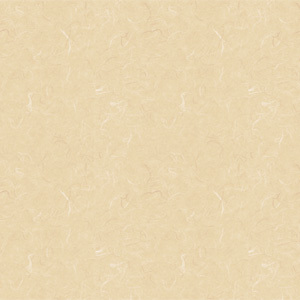 ** Regular visitors to this site know that I completely reject the so-called "Two Source Theory." Cf. the third footnote attached to the post here to learn why. *** Cf. the homily for the Second Thursday of Advent.